Officially Finished…with a few days to spare! I am “Officially Finished” Amy and Bruce’s wedding quilt! The quilt has a binding, a hanging sleeve….. 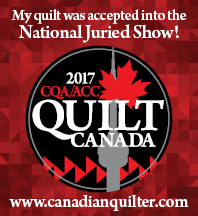 The thing that surprised me the most was how much I loved having a hand-quilting project to work on. I knew I would miss having something to stitch on in the evenings. I kept thinking about my unfinished blocks of “Bouquets for a New Day”. I only have 4 blocks left to finish…. and a sawtooth border that is not going to make itself!! Hopefully, I can get it finished in the near future so I do not suffer too long from “Hand-Quilting Withdrawal”! I worked on this block today. I am auditioning my fabrics for something that says “vase” to me. I love this bit of detail. It is ” reverse appliqued” so the background shows from underneath the leaf! Four years ago, I fell in love with this pattern! It is Sue Garman’s “Bouquets for a New Day”. I finished eight of the 12 blocks and set them aside. Other projects called my name! Do you recognize this blue fabric? It is one of the fabrics I used in Amy’s quilt. I also have it in brown…and red…and green! Anyway, I started thinking about these blocks and how much I would love to finish this quilt…soon! But, I had a tiny problem. I was not in the habit of pre-washing my fabric four years ago. If I was going to have any surprises with colors running, I wanted it to be now and not later when the blocks were stitched into a quilt. So I decided to wash the finished blocks in Synthrapol. I am so glad I did! The excess dyes came out of the fabric…and down the drain! …I finished the 2nd block of Civil War Bride!! You know the feeling when you are just about to finish a really good book? Part of you wants desperately to finish the book …another part of you wishes it would never end…because you will never enjoy a book as much as you did this one? Well! That is exactly how I feel about Amy’s quilt. I am soooooo close to finishing, but I know I am taking my time because I have loved working on this quilt every step of the way. I am sad to see this journey come to an end! I found the perfect place to stitch at the cottage! Tons of natural light and amazing scenery to keep me inspired! I stitched and I stitched and then I stitched some more. Finally I finished all of the hand-quilting! Once the label and binding are in place, then I will be Officially Finished! I also had a chance to finish the latest block of Sue Garman’s “Friends of Baltimore”….last night at midnight! I gave the block a bath…..
……and then pressed it this morning! Is it just my imagination or is time whizzing by faster than normal? I looked at the calendar this morning and realized (much to my surprise!) that September 1 is not that far away. Amy and Bruce are getting married on September 1 and I still have a fair amount of quilting to do on their quilt. Let’s be honest, there is a lot of quilting left to be done! The bottom right hand block still needs to be done, as well as the the borders. And it will need a binding…and a label….yikes! I love putting hidden gems in my quilts. I found a fabric that had little sayings printed on it. I fussy cut 4 of the words and stitched them in to a flower on each border. I used a Frixion marking pen to mark the quilting lines. I was thrilled to be able to mark the quilt top and not have the marks disappear before my eyes while I stitch. Brilliant! Speaking of brilliant….. Solar Iced Tea! Fill a large pitcher with a 8 cups of water. Toss in 6 tea bags and leave in the sun for 6-8 hours. Easy Peasy!